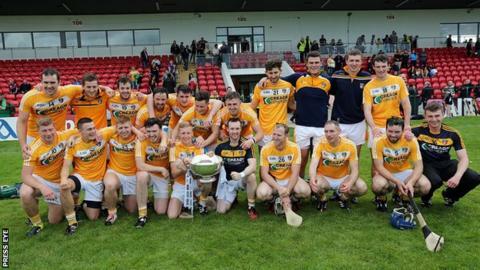 The Ulster Senior Hurling Championship is to undergo a major revamp next season with the introduction of a two-tier structure in the province. From 2016, Antrim, Derry, Armagh and Down will compete in the top level, with Fermanagh, Donegal, Monaghan and Tyrone in tier two. Cavan have opted out of the competition for now but could enter in the future. Semi-finals and a final will be played in both tiers, with one county being relegated and another promoted. Antrim will play Derry in the top level semi-finals, with Armagh facing Down, and the winners contesting the final. The semi-final losers will meet in a play-off and the losing side will swap places with the winner of the second tier competition, which will be played along identical lines. The timeframe for the series has not yet been confirmed but it is understood that the preferred date for the Championship may be July. The dates will depend on when the Christy Ring and Lory Meagher competitions end - in the 2015 season both finals were played on 6 June. The new format will initially be brought in for a two-year trial period.